The WriteOne Creative Services is proud to celebrate 14 years serving local, national and international graphic design, web design, web maintenance, and creative & business writing clients. Passion isn’t just a word…. It’s what you want, what you deserve from your designer. You’re entitled to someone with passion for graphic design, web design and for the written word, someone with digital photography artistry, who can take your concept and transform it into reality, quickly, creatively and affordably. Founder Deb Kelley received the Theatre Tampa Bay JEFF NORTON DREAM GRANT to put on an original production, “A Necessary Conversation” about the aftermath of gun violence in school at Straz’ TECO Theatre in January 2018. All proceeds were donated to Moms Demand Action. After the Parkland shooting, she expanded the play to include youth voices. On April 26-27, 2019, the timely play about bullying, mental health and gun violence – winner of Broadway World’s 2018 Award for Best Actor and Best Actress – will be part of NYNE’s season. Later in 2019, she will be is directing her play “11:11” and “47 Reasons to Live,” written by Peter Nason. Talk-back with community experts will follow evening performances. Getting your company message across doesn’t need to cost a fortune. The WriteOne Creative Services is a comprehensive woman-owned and operated, independent graphic/web design and copy-writing business that offers the talent and design/print capabilities of an agency, without the overhead. Design does not have to be expensive to be effective. Whether refreshing an existing business or starting from scratch, The WriteOne Creative Services is your one-stop shop for every type of creative need with every facet of your business covered. With over a decade of experience in design and copywriting, The WriteOne Creative Service becomes an extension of your business and can do it all for you: from the graphic design/print of a custom logo, business card, brochure, postcard (with mailing service), flyer, print advertising, newsletter, letterhead to PowerPoint template through web design with specialized custom web site with web mastering. Writing services include press releases, newsletters, advertising to business profiles. I have you covered for your banner design or custom tradeshow displays and even the DTG screen printed tee shirts or embroidered polo shirts you wear and the imprinted promotional items you hand out to your clients. The WriteOne Creative Services is literally your business’s one stop shop. Celebrating 13 years serving clients locally and nationwide, The WriteOne Creative Services offers customers a variety of affordable creative solutions. 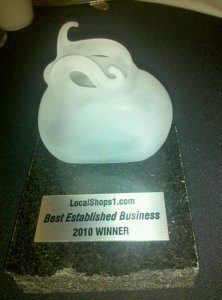 Thanks to incredible customer nominations, The WriteOne Creative Services won Local Shops1’s award for “Best Established Business” for 2010 and became a Top 4 finalist for “Best Customer Service“ for AOL Patch, Westchase. Let the WriteOne Creative Services take care of your creative and marketing needs, so you can concentrate on the business of running and growing your business. My only goal is to exceed your expectations. My success is measured in your satisfaction.